Aaron Martens put together a long string of single-digit finishes to win his second career Angler of the Year title. 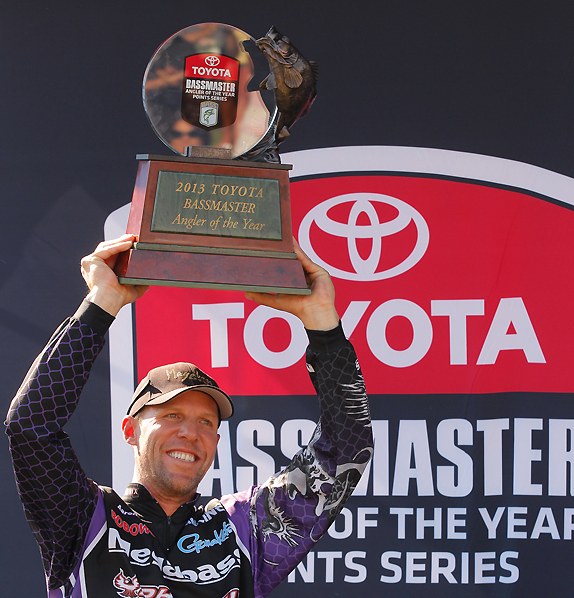 By the time Saturday evening rolled around, Aaron Martens was still having a hard time comprehending that he'd won the 2013 Toyota Tundra B.A.S.S. 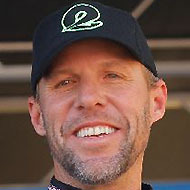 Angler of the Year award after starting the season with an 85th-place finish. He didn't recall that there was a precedent for such an achievement. He'd set it himself in 2005, when he captured his previous AOY despite an 88th in the opener at Lake Toho. "It feels like that was a long time ago, but it really wasn't that long," he said. "This one feels pretty good � probably even better than the last one. I just wish I could start catching them at the beginning of the year." He's been incredibly hot since the season's fourth event and, if not for mechanical problems on day 4, would've notched his fifth consecutive single-digit finish this weekend at Michigan's Lake St. Clair (he ended up 12th). He started the day just a pound and a half out of the lead and might've won if he could've brought his bag (estimated at 20 pounds) to the scale. "I couldn't believe my family was here," he said. "I've been fishing for a long time, and this was one of the best days of my career. Then it got better." He understood how difficult the day had to be for Edwin Evers, who'd led the AOY race for most of the season before faltering in this event and watching the coveted title slip away. Evers finished no lower than 30th in any of the first seven tournaments, but ended up 54th at St. Clair. "I feel for Edwin because he deserves this as much as anybody. It's great for me, but I have a lot of respect for him. He's a great angler." Martens said he assessed his chances of winning the AOY as no better than 1 in 10 when the tournament got under way. He needed a big assist from Evers, who held a 30-point advantage, and didn't plan on getting it. Evers opened with a 13-pound bag on day 1 and Martens simply strolled right through with the same type of performance he's been putting on since late spring. "I didn't have any distractions this year and I think that was the most important thing," he said. "My family was with me a lot, but they're not a distraction. I stayed away from all the dock talk and the only person I talked to about fishing was Todd (Faircloth) � we shared a lot of pattern information and stuff like that. "I'm not really sure how it happened, but it was just a phenomenal year." His focus will now go back on winning the Bassmaster Classic, which he's never done (he has four runner-up finishes in that event). It'll be held next year at Lake Guntersville, which is only about a 75-minute drive from his home. "I'll try to go over there a few times before the cutoff (in December) � I always say that, but then I never do it. It should be a good Classic as long as the umbrella-rig guys don't beat up the fish too bad this winter. "I really need to win that thing."